Red lipstick has a strange place in our society. It's both a staple and a statement. There are so many reasons to have both bright red lipstick and nail polish in your arsenal. For one, it makes pictures look absolutely timeless. Even if you've been swiping through Instagram photos all day when you're wearing red lipstick you look like you've been using a typewriter and riding in a T-Bird all day. In a way, red lipstick can make a character truly come to light. When a vampire is only wearing a cloak and a white ruffled shirt she could just be an art student. But once she's got her red lipstick and nail polish on, there's no doubt who she is! 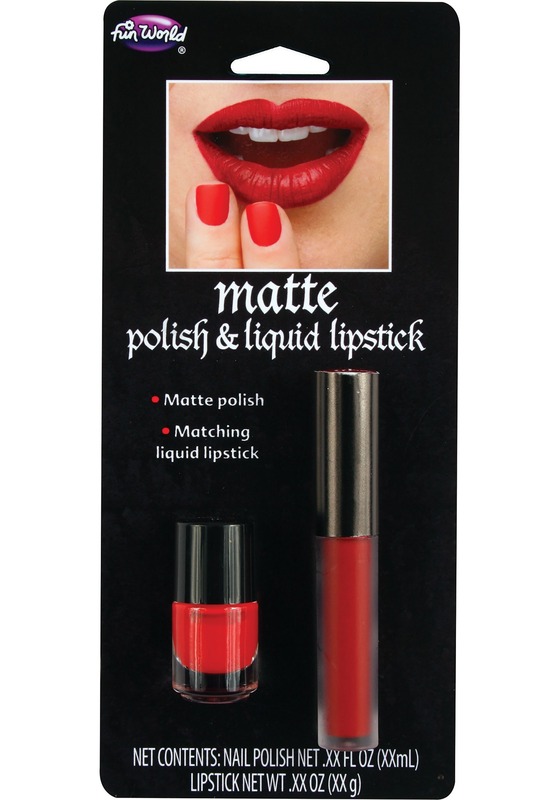 Next time you're rocking a dramatic look, don't forget the pop of color with this sweet red nail and lip set! Giving yourself a dramatic pout is super easy with this liquid lipstick. It dries with a matte finish for a modern touch and washes off with soap and water. The nail polish simply peels off when you're ready to go back to normal which makes it a great option for kid's costumes. You might be dressed with your shoes on, you're not quite ready if you don't have your lipstick on. So go ahead and fully transform. Once you've gone red, you're ready!